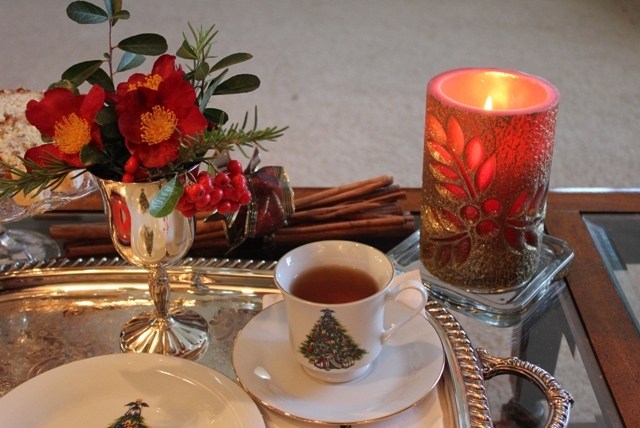 Today I set Tea for One by the fireplace. 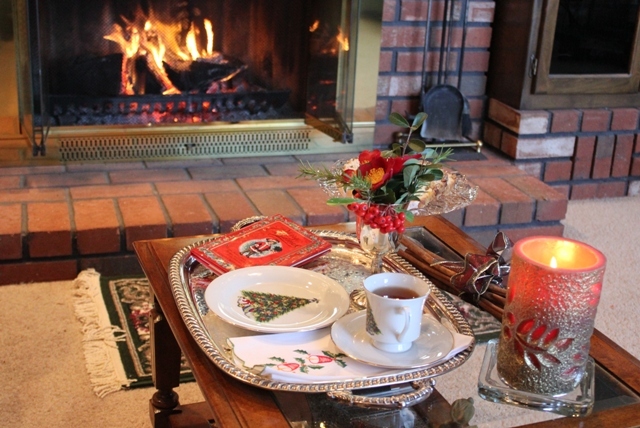 In My Cozy Corner I looked at the fire with a glowing flame and enjoyed a cup of tea while reading my little Christmas book filled with best-loved Christmas quotations and songs-from Louisa May Alcott and Charles Dickens to Sir Walter Scott and Washington Irving. This little book has recipes, and gift ideas for holidays. It reminds me of the simpler side of Christmas, to the magic memories of childhood and traditional heartfelt associations. 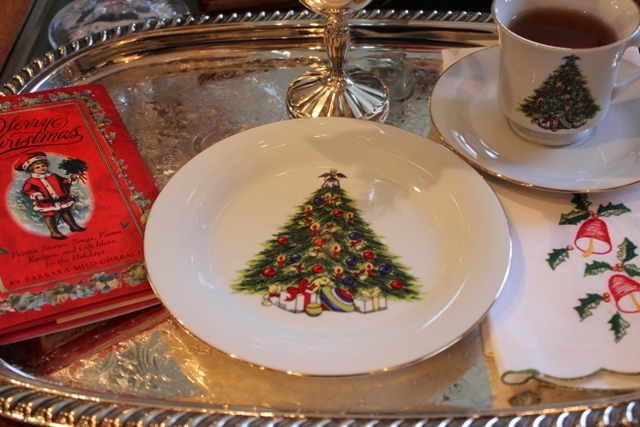 It is decorated throughout with sweet Victorian Christmas cards and other charming nineteenth-century illustrations. So warm and cozy by the fireplace. 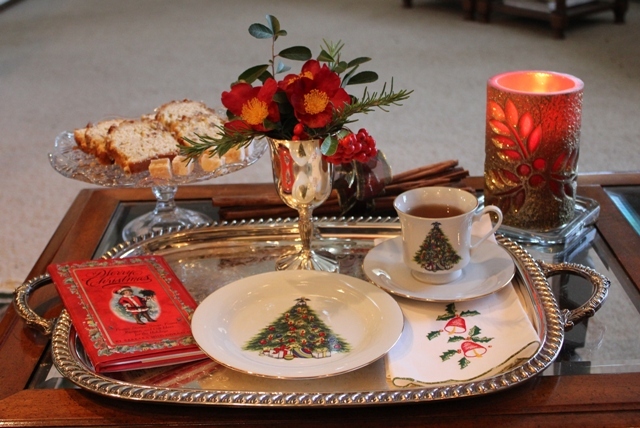 The cup, saucer and dessert plate are World Bazaars Christmas Tree Bazaar I found at a yard sale. The silver-plated goblet I found at a yard sale. 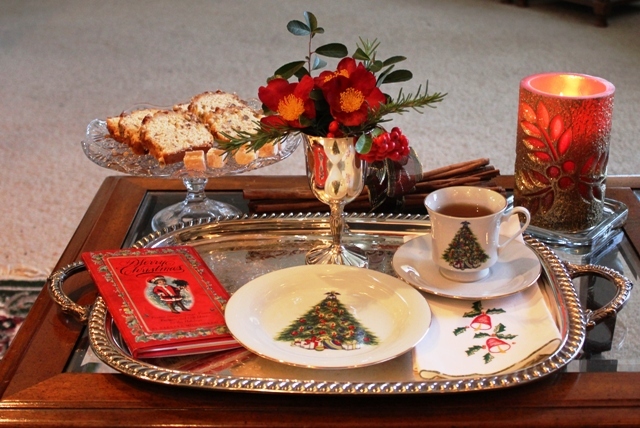 I had it displayed in Tablescape #1 and the bundle of cinnamon sticks I have had for years. The silver-plated tray I bought at a thrift store for $5.00 dollars. Yum!!!! 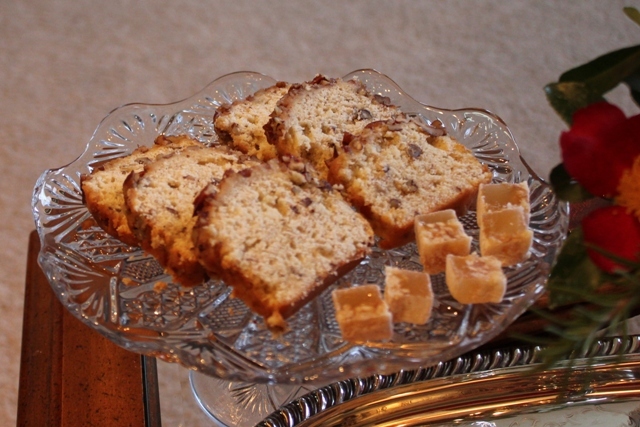 Banana Pecan Bread with Pineapple & Macadamia Fruit Delights for a delicious treat. I'm still blessed to have some wonderful greenery in the garden. 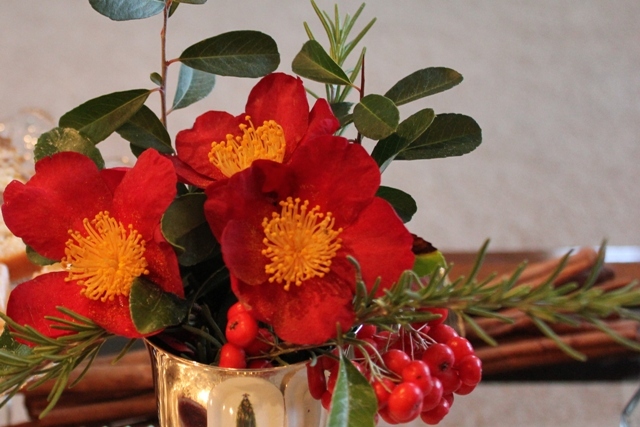 Rosemary, Pyracantha berries and Camellia sasanqua called 'Yuletide' very appropriate for the Holiday Season. 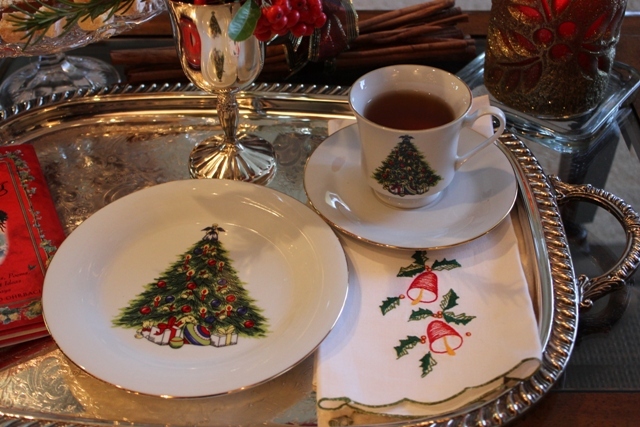 A vintage Christmas Tea Napkin I found at an estate sale. 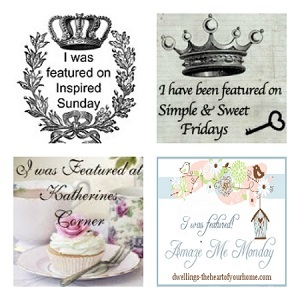 Thank you so much for visiting me and please link back to the fabulous blogs for more vintage, inspiration and just wonderful eye candy. Oh what a beautiful setting for tea for one. I love being fireside too. What a lovely book that must be. That looks just lovely! So nice and cozy by the fire! So lovely. I think my mother in law had those dishes. I love them. Happy VTT! Very pretty! Love those flowers. Thanks for sharing. 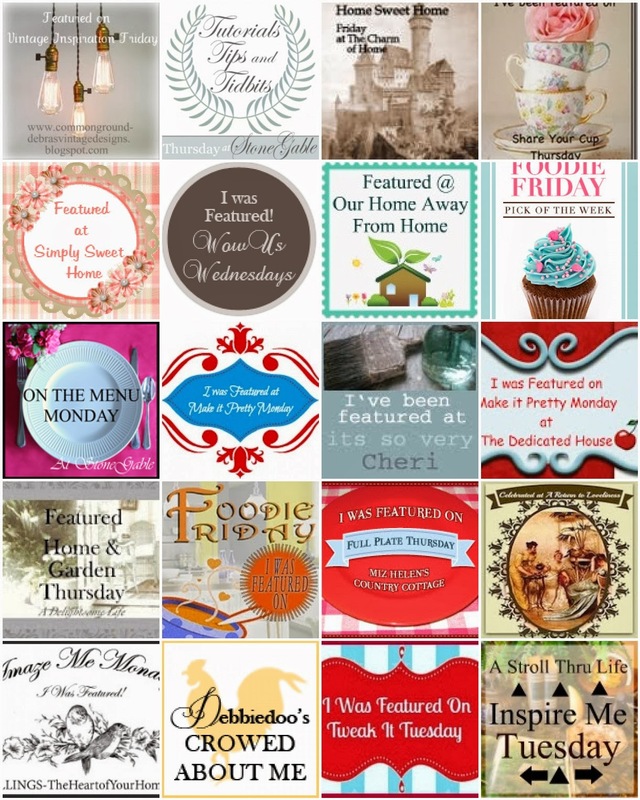 Just hopping by from Inspiration Friday. 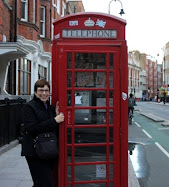 Btw, I'm a follower now and I hope you choose to do the same for more mutual blog visits. 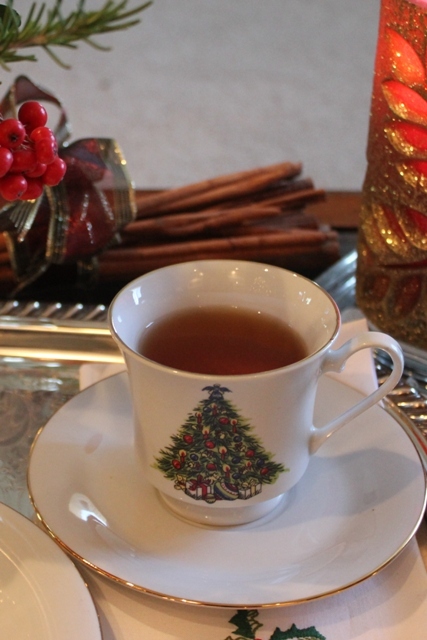 Now all you need is the book "A Cup of Christmas Tea"...a delightful, melancholy story!! Oh Betty this is one of my favorites ever! 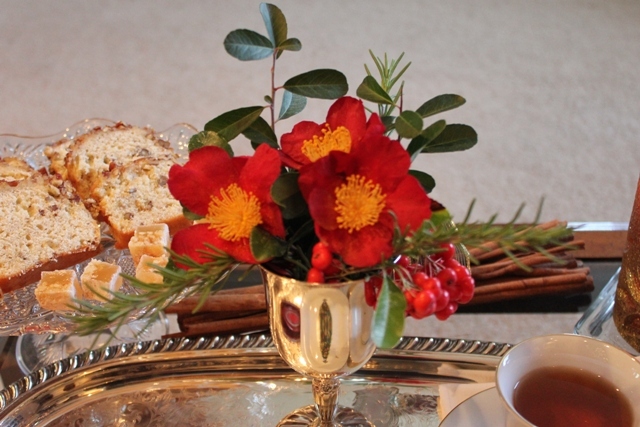 I absolutely love the silver cup with the gorgeous fresh greenery! And, I so miss having a home with a wood-burning fireplace. We had one in our last house and there is just nothing quite like that crackling sound. Thank you so much for joining the party this week! Everything looks so cozy and delicious too. I love times I can spend by myself which are few and far between. Very nice setting, everything is lovely. 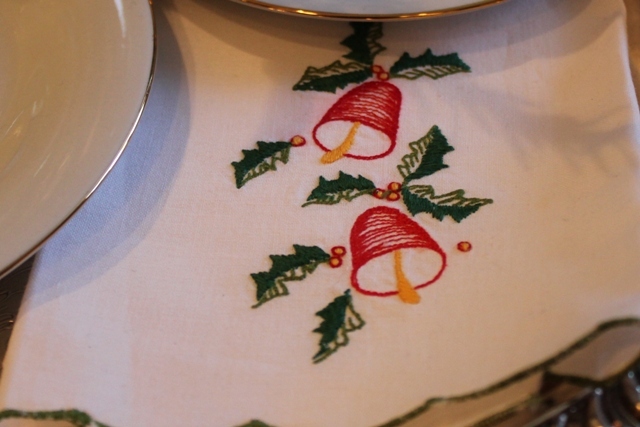 Very pretty trayscape...love that festively embroidered napkin. That is just gorgeous...how fun! Beautiful.. love that tray!! Merry Christmas! What a great looking table setting for one!! I love it when something comes together and looks so good for such a bargain price and you hit it right on the mark! 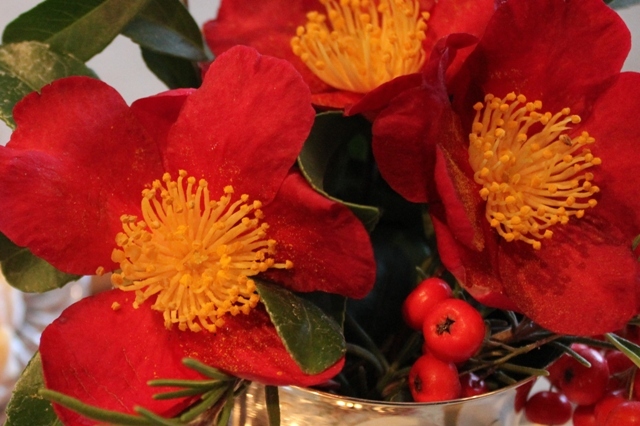 Also, your Camellia is just beautiful. I also have a few in my front yard but not that variety. They came with the house so I don't know their names, as they are each different, but they sure are not as pretty as yours. Lovely. Looks relax and it's definitely somewhere I wanna be...especially with those yummy looking banana cake and fruit delights! :) Merry Christmas to you!